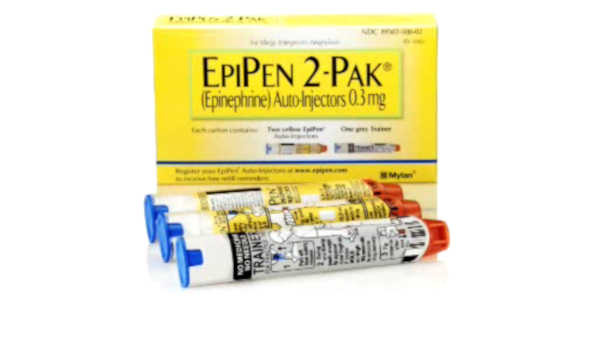 NEW YORK -- Mylan is bulking up programs that help patients pay for its EpiPen emergency allergy treatment after weathering heated criticism about an average cost that has climbed more than 600 percent over the past decade. But the drugmaker didn't budge on its price, which has drawn ire both in Congress and from families that have had to shell out increasingly large sums for the potentially life-saving treatment. "That's just going to come out in the premiums," said Sabrina Corlette, a research professor at the Georgetown University's Health Policy Institute. "Everybody suffers, except the Mylan investors." The average price of a two-dose EpiPen package climbed to about $608 earlier this year, up from around $94 nine years ago, according to the Elsevier Clinical Solutions' Gold Standard Drug Database. Mylan CEO Heather Bresch told CNBC Thursday that lowering the price was not an option. "Had we reduced the list price, I couldn't ensure that everyone who needs an EpiPen gets one," she said. Democratic presidential candidate Hillary Clinton and members of Congress from both parties have quickly ramped up criticism of the company and its pricing. Pharmaceutical and biotech industries can fuel American innovation, and combat debilitating diseases, Clinton said Wednesday. But she added that "it's wrong when drug companies put profits ahead of patients, raising prices without justifying the value behind them." Bresch said Thursday that Mylan gets $274 for a two-dose EpiPen package. The rest of the $608 price goes to entities that stand between the drugmaker and the patient, like insurers, pharmacy benefits managers, wholesalers and drugstores. "This isn't an EpiPen issue," she said. "This isn't a Mylan issue. This is a health care issue." However, it is Mylan that is increasing the price of the drug and the company stuck by those price hikes Thursday. That stance brought a wave of new money from investors who drove Mylan's shares up more than 3 percent in early trading, while all major U.S. indexes were in decline. Mylan did say, however, that it was doubling the eligibility for its patient assistance program to people with incomes four times higher than the federal poverty level. It said that means a family of four making up to $97,200 would pay nothing out of pocket for the treatment. It also noted that its $300 savings card would cut the bill in half for patients who would otherwise have to pay full price for the EpiPen. Patients also will be able to order the injected medicine directly from the company, to help lower costs. These measures could provide significant help for people with no coverage facing the full bill. But they might have more limited value to a patient whose insurer will cover most of the bill anyway and whose future premium could be affected each year. Customers of Express Scripts Holding Co., the nation's largest pharmacy benefits manager, pay about $73.50 out of pocket for an EpiPen prescription, spokesman Brian Henry said. He noted that price has stayed relatively stable the past couple years. Last year, more than 3.6 million U.S. prescriptions for two-packs of EpiPens were filled, according to data firm IMS Health. That brought in sales of nearly $1.7 billion for Mylan.